The evening of the meeting on Tuesday 8th November 1887 was wintry and wet. Perhaps some people had been put off by the weather. The Victoria Hall on Buxton Road, a plain neo-classical building fronted by a portico of ionic columns , (later the town’s first cinema, swallowed up by the co-operative store in 1938), was less crowded than expected, considering the celebrated artist and writer billed to speak. 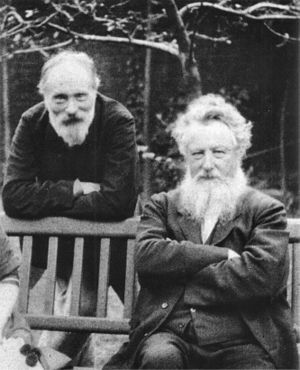 But William Morris, renowned for his volume of poems Earthly Paradise, was not in Huddersfield to speak about literature. 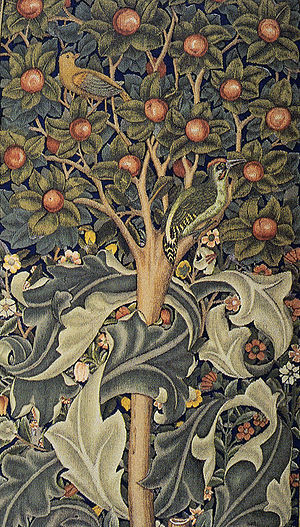 Nor about the artistic design and production of wallpaper, textiles and stained glass for which he was well known. His visit was not as spokesman and founder of the Society for the Protection of Ancient Buildings, a cause very dear to his heart. Morris’ invitation had come from a local woollen manufacturer, 45 year-old George Thomson of Woodhouse Mills, Deighton, a devotee of the ideas of the art critic and social philosopher, John Ruskin. The previous year, Thomson had converted his family business into a co-operative venture which allowed the workers to help run the firm and share the profits. This proviso was evidently agreeable to Thomson, who joined Morris on the Victoria Hall platform. Alongside was another prominent co-operator, radical Liberal and future mayor of Huddersfield, Owen Balmforth, named after the leader of an earlier generation of Socialists, Robert Owen. A leading local Liberal took the chair: Ernest Woodhead MA, outspoken son of the Huddersfield Examiner proprietor Joseph Woodhead, had become editor of the paper two years earlier, although only 28 years old. Morris too was a newspaper editor and journalist. But his journal was a far cry from the Examiner! The Commonweal was the revolutionary publication of the Socialist League, founded by William Morris and others, including Karl Marx’s daughter Eleanor. Morris actually started political life as a radical Liberal. In 1876, outraged at the atrocities carried out by Turkish troops in Bulgaria, he became treasurer of the Eastern Question Association, which backed Liberal leader Gladstone’s campaign against the Tory government’s pro-Turkish policy. After prime minister Disraeli sent British ships to defend Istanbul from Russia in 1878, the Liberals caved-in to jingoistic hysteria, and Morris, disheartened by politics, returned to his workshop and study. In 1883 he joined the Democratic Federation, soon to be transformed into the Social Democratic Federation, an avowedly revolutionary Socialist organisation. At 49 Morris had discovered a cause – one which offered hope of salvation from all the ugliness, poverty and suffering of modern society he found so offensive to his love of truth and beauty. Frustrated by the SDF’s autocratic leadership under H.M. Hyndman, Morris helped set up the Socialist League in late 1884 and became its treasurer. He threw the same energy and dedication into the movement that he had into his art, touring the country addressing hundreds of meetings. He not only edited Commonweal, but also wrote much of the copy, and some of his political poems and novels were first serialised in its columns. However, Woodhead’s opposition to Socialists did not prevent him speaking out when they were victims of injustice. The very day Morris was in Huddersfield, a chain of events unfolded in London which were to have a deep impact on the working class movement. For over two years, unrest had been growing about unemployment, repression in Ireland and police harassment of Socialist open air meetings. On 8th November, the chief of the Metropolitan police, Sir Charles Warren, issued a proclamation banning meetings in Trafalgar Square. On Sunday, 13th November, thousands of police and troops, the latter with fixed bayonets and live ammunition, cordoned off the Square as tens of thousands of Radicals, Irish nationalists and Socialists marched to demand the right of assembly. Morris encouraged the Clerkenwell contingent with a speech, ‘of a determined character’ according to the Examiner, in which he demanded the release of the gaoled Irish MP William O’Brien. He was in the thick of the fighting with the police, who soon dispersed the unarmed and disorganised protesters. Hundreds were injured, including two fatally. The day went down in the annals of working class history as ‘Bloody Sunday’. The next day, the workers of London again tried to assert their right to meet in the Square, and again the police battered them off the streets. A bystander, Alfred Linnell, was trampled by a police horse and fatally injured. He earned immortality through commemoration in a ‘Death Song’ composed by William Morris, who delivered a deeply moving oration at the graveside. The events of Bloody Sunday, and its aftermath, convinced Morris that Socialism would always meet with violent resistance and the workers had to be better prepared if they were to confront the state. Others, like George Bernard Shaw, drew different conclusions. Workers could never win by physical force and Socialism had to be introduced gradually. Morris stuck to his revolutionary views until his death in 1896, although an Anarchist take-over of the Socialist League and of Commonweal, combined with his declining health, forced him to take a less active part in political life. When Morris visited Huddersfield in 1887, there were only a handful of Socialists in the area, according to weavers’ union leader Ben Turner, a supporter of the Socialist League. However, five years later, the town and neighbourhood, particularly the villages of the Colne Valley, played an important part in the Socialist revival and the founding of the Independent Labour Party. It is impossible to determine if Morris’ visit or his writings inspired other local Socialists. There were probably more people in the Victoria Hall that night who were as mystified as the 1996 Centenary pundits continue to be. How could a genius of such romantic, artistic sensibilities be a revolutionary Socialist? But for Morris, art and Socialism were inseparable. The future depicted in his novel, News From Nowhere, was not Stalin’s brave new world of steel and concrete. ‘It is our business to try and make this earth a very beautiful and happy place.’ he said at the funeral of Alfred Linnell. One hundred years on, after a turbulent century of technological ugliness and destruction even he could not have envisaged, Morris’ hopes for a beautiful, peaceful world are more important and inspiring than ever.